Pest Expert Clothes Moth Killer Papers are designed for protecting garments and fabrics in drawers and wardrobes from clothes moth infestation. 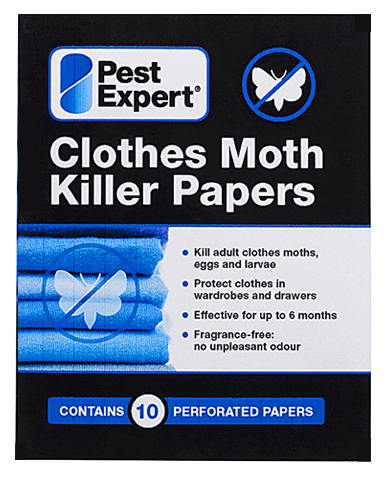 Pest Expert Clothes Moth Killer Papers are new-to-market and contain the strongest concentration of the fast-acting pyrethroid insecticide transfluthrin (0.49%) available for amateur use. Each strip offers outstanding protection for up to 6 months, killing clothes moths at all stages of the life cycle – from eggs to larvae to adults. Pest Expert Clothes Moth Killer Strips are completely odourless, ensuring that your wardrobe and clothing remain fresh and protected against moth damage. Pest Expert Moth Killer Papers have an outstanding success rate at eradicating moths quickly and playing a key part in comprehensive clothes moth prevention. The Moth Papers can be separated into individual pieces along the perforations and used to line drawers or inserted between layers of clothing or bedding, providing protection to stored garments and fabrics. Strips can also be attached to wardrobe doors or hung over clothing rails or hangers. Each section of moth paper has a calendar to clearly indicate when you should replace them. Each pack contains 10 perforated papers in 2 strips of 5 pieces. Each 5-piece strip will provide protection to a space of approx 1 cubic metre, which equates to 1-2 large drawers or a standard single wardrobe. For a complete moth treatment package, see our best-selling Clothes Moth Kits, which contain a combination of our most effective products for clothes moth control, including Formula ‘C’ Clothes Moth Killer Spray and Formula ‘P+’ Foggers as well as Moth Cassettes, Moth Killer Papers and Clothes Moth Traps. Excellent product, worked just as the website said. A very impressive company!!! Arrived promptly the next day and put straight in the storage boxes! Works as stated on the website, so I'm a very content customer. Really impressed with the product! Not seen any new holes in my clothes since implementing the papers! Fast delivery too! Deffo does what it says on the tin! Next day delivery as standard, outstanding advice, products which do what they say they will. I'm 100% satisfied. Well done Pest Expert!